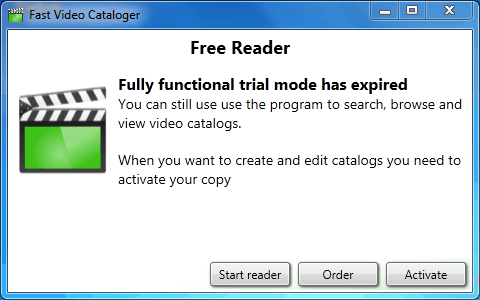 The Fast Video Cataloger free reader mode is activated automatically when the free trial period is over. In reader mode you are restricted from creating new catalogs or adding videos but you can always unlock your software again by purchasing a valid license. The reader mode opens many new opportunities for collaboration on your work with video. Why does the reader mode exist? We want Fast Video Cataloger to add as much value as possible to you as a user. And Fast Video Cataloger adds value to your collaboration with others. Via the reader mode you can now collaborate with whoever you wish without any extra licenses.